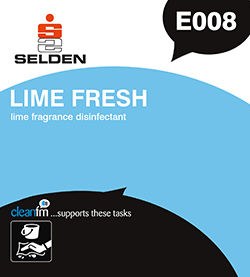 Clean citrus odour suitable for all areas. Safe on fabrics and floors. Penetrates and disperses soils enabling effective disinfection of surface. More versatile than pine disinfectant. A quaternary ammonium bactericide which conforms to BS 6471 Grade Q.A.P. 30. As a general disinfectant for schools, offices, factories, canteens, clubs, restaurants, hotels etc. Disinfecting: Prepare a standard solution of 1 part to 30 parts water for all general disinfecting. Heavy soiled articles should be rinsed clean before disinfection. Disinfectant solutions should always be freshly prepared. Use Lime Fresh neat for drains, toilets, waste pipes, refuse bins etc. For washing hard surfaces, walls, work tops etc. dilute Lime Fresh 1 part to 100 parts water. As an air purifier and spray, dilute 1 part to 75 parts water. N.B. Do not mix with other chemicals or cleaners. Composition A blend of cationic and nonionic surfactants, sequesterants and lime oil. All surfactants contained in Selden Products meet the requirements of the EU Detergent Directive 2005 – 2004/648/EC. This requires all surfactants to break down both quickly and completely into harmless material such as CO2 and water. .